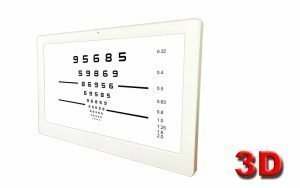 Working closely with our development partners, we have produced a range of clinical quality monitors which are capable of displaying stimuli to one or both eyes at any point on the screen. The monitors incorporate patented micropol technology so that all the odd rows of pixels are polarized in one direction while all the even rows are polarized in the other direction. 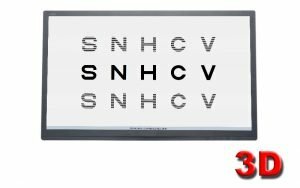 With the patient viewing the monitor through polarised filters, stimuli can be presented to one eye by drawing on the odd rows, the other eye by drawing on the even rows and to both eyes by drawing on odd and even rows. This opens us exciting new opportunities for binocular refraction and binocular vision testing. It can also be used to generate some stunning 3D images. The Thomson Test Chart incorporates a wide range of tests which exploit this technology. Note: Monitors are available with linear or circular polarisation. Please contact us for further information. 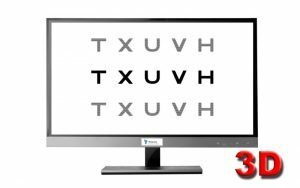 Used in conjunction with the Thomson Test Chart software, the monitor opens up a new world of binocular vision testing! Binocular balancing: In binocular balancing mode, three rows of letters (or other optotypes) are presented on the screen. 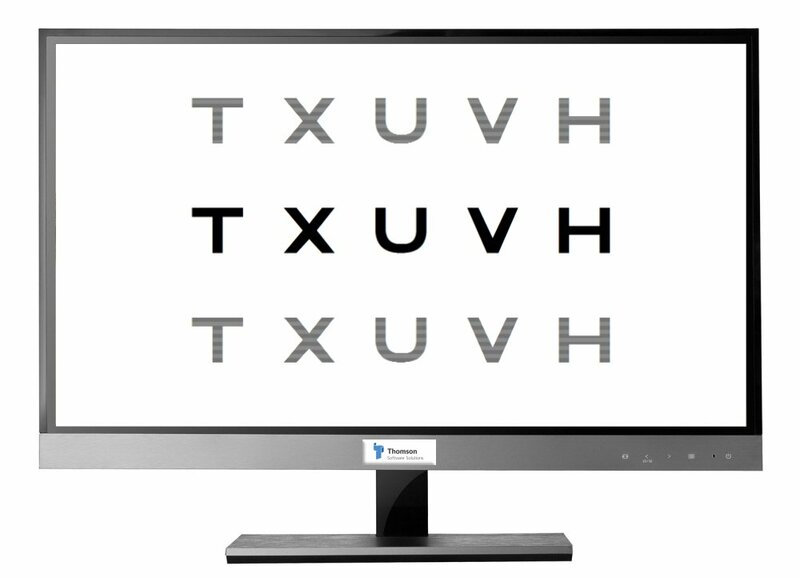 The top and the bottom rows are seen by the right and left eyes monocularly while the middle row is seen binocularly.This allows the practitioner to simultaneously assess the vision in both eyes monocularly and binocularly. This is particularly useful in the final stages of refraction for binocular balancing. Fixation disparity test: The fixation disparity test provides a rapid way of detecting the presence of a vertical or horizontal fixation disparity and determining the appropriate prismatic or refractive correction.There are three versions of the test available: Horizontal and Vertical (shown), vertical only, horizontal only. With the polarised visor placed in front of the patient’s eyes, one vertical and one horizontal red bar is seen by right eye and the others by the left eye while the rest of the screen and the surround is seen binocularly. Polatest 1: The left and right horizontal bars are seen monocularly by the right and left eyes and likewise for the vertical bars. Any horizontal or vertical displacement can be neutralized using prisms. This is not directly equivalent to dissociated phoria or fixation disparity. However, there is a large body of literature describing this test and its clinical application. Polatest 3 (Aneisekonia): One half of the box is seen by the left eye and the other by the right while the central cirlce is seen binocularly. If there is a difference in the perceived image size between the two eyes, one half of the box will look larger than the other. The two tests can be used to detect vertical and horizontal aniseikonia respectively. Polatest 4 (Cyclophoria): This test is designed to measure relative cyclophoria between the eyes. One eye sees the “dial” while the other sees the markers. The central circle is seen binocularly.The patient is asked to report which marker the dial appears to be pointing to. The markers are placed at 5 degree intervals. Polatest 5 (Steropsis): This test measures distance stereopsis. One eye sees one pair of triangles while the other sees the other pair. The central circle is seen binocularly. The disparity can be varied using the scroll bar or by pressing the PgUp and PgDn keys on the keyboard or remote. The current disparity is displayed on the screen. 3D Images: This mode allows a variety of stunning 3D images to be displayed. These images have been generated specifically for the 3D monitor and present two disparate images on the odd and even rows of pixels.This test allows the patient’s stereopsis to be assessed – while amazing them at the same time! And you might be interested in ..